- ACHILLES II - (10 Days/9 Nights) - 3 Nights Istambul & 8 Day Cruise. Istanbul, Mykonos, Patmos/Greece, Kusadasi/Turkey, Rhodes/Greece, Ag. Nikolaos/Crete, Santorini, Athens. 4 Transfers, Airport/Hotel, Hotel/Port, Port/Hotel & Hotel/Airport in Istanbul . Today we visit St. Sophia, Blue Mosque, Top Kapi Palace. After lunch visit the Grand Bazaar. Transfer to the Port to embark on the ship. Today we will visit the Spice Market and we will experience an unforgettable cruise along Bosphorus. Transfer to the port. The ship sails at 7:00pm. Today we visit two ports of call. Patmos, (7:00am to 10.30am) and Kusadasi, (2.30pm to 8.30pm). Today we visit Ag. Nikolaos, (7:00am to 11:30am) and Santorini, (5:00pm to 9:00pm). 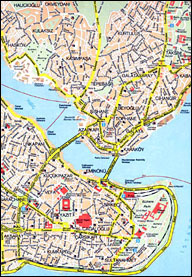 Arrive at the port at 6:00am and sails for Istanbul at 11:00am. Arrive at the port at 10:00pm. Disembark and transfer to the Hotel.